This article will discuss deploying FileVault 2 via a Configuration Profile to managed Macs with Jamf Pro using either an Individual Recovery Key, an Institutional Recovery Key, or both together. Skip this section if you do not plan to deploy an Institutional Recovery Key. Jamf has excellent documentation on how the Institutional Recovery Key is created. In order to wind up with a key we can upload to Jamf Pro, use the directions in the section titled “Creating and Exporting an Institutional Recovery Key without the Private Key” to wind up with a .cer file. Begin by creating a new Configuration Profile, name it whatever you’d like, and we can leave this as a Computer-Level profile. The FileVault settings are inside of the Security & Privacy payload. With this payload, however, comes General (including Gatekeeper), Firewall, and Privacy. Make sure there’s not already an existing Security & Privacy payload scoped to the same machines that is managing those settings as we don’t want duplicate payloads. “Record Number” Message is optional, but something like “Please Give IT This Number” would make sense here. The setting to Enable Escrow Personal Recovery Key is only applicable for macOS 10.13 and later. In order to redirect the Individual Recovery Key to Jamf Pro for macOS 10.12 or earlier, we need to use a completely separate payload. It is NOT possible to deploy BOTH redirection payloads to the same computer. This used to be acceptable, but no longer. Now if we were to deploy both redirection payloads to the same machine, FileVault will not enable. Depending on which settings we enabled for escrowing or redirecting the Individual Recovery Key, we may see additional entries in the Certificates payload. This is normal, and required. That’s it! We’re ready to scope the Configuration Profile out to our managed Macs and kick off the encryption process! 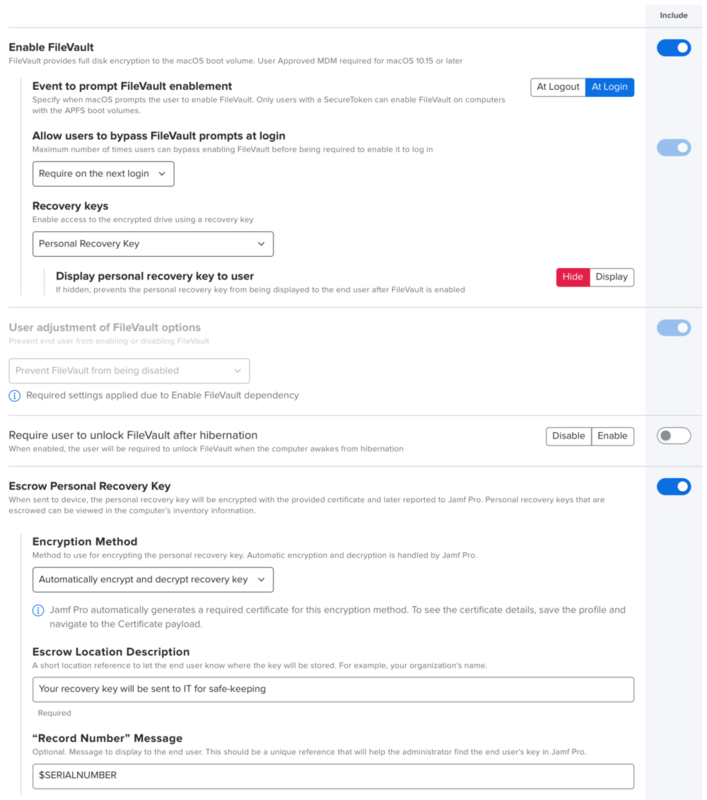 Once the Individual Recovery Key is sent back to Jamf Pro (if configured) we can see it in an individual Computer Inventory Record under the Management tab, and then under the FileVault 2 subheading.